As the global stage opens-up to more actors and voices in multilateral and multinational processes we feel compelled to be part of alliance of groups calling for greater recognition of care needs and deficits in domestic and international policy. 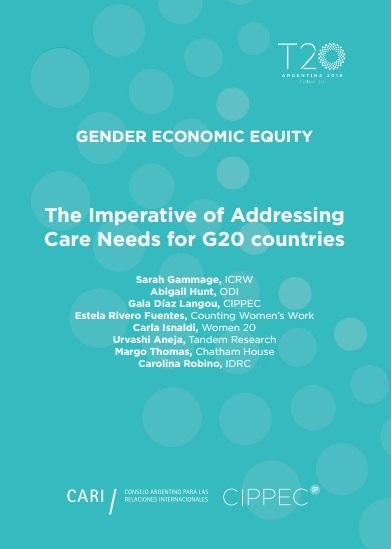 As part of this strategy, ICRW contributed to the T20 policy brief on care which outlines the position of a group of research and non-governmental organizations on care needs and care policies in the G20 countries. Care is essential for the young, the sick and the elderly. At some point in our lives we all need care and benefit from the care of others. This policy brief underscores that we all have a right to care and to be cared for. The goal is to develop health care, education and social protection systems that support caring without penalty, either for those who receive care or for those who may choose to enter the labour market. In practice, this means that those who choose to care can do so, and those who choose to work can be sure that their loved ones and family members are being cared for adequately. The T20 brief provides a summary of why addressing care needs is fundamental for women’s economic empowerment and labor market participation and frames these policies in terms of protecting the right to care and be cared for. We call for more effort to recognize, reduce, redistribute and represent unpaid care work and to protect the rights of paid care workers. We provide a number of examples of successful policy and program initiatives for G20 countries to consider expanding in their own domestic policy agenda as well as their development assistance to further women’s economic empowerment globally. To download the brief, click here, on the cover image above or on the button below. And to view other publications on the T20 website, click here.